What a beautiful spring morning. The sun shines brightly through my home-office windows as it burns off the morning dew from the deck, the lawn and the trees. A dozen or more birds are taking turns at the birdfeeder just off the deck. The weather report says Detroit might hit seventy-degrees for the first time this year, so I open the office windows and let in some long overdue fresh air. The smell of spring invites me outdoors, but I must get this work done. I turn my attention back to the computer with a new resolve; finish, then get outside and enjoy this day. Both dogs, Gracie and Joker, are resting upstairs, as is their custom after we get back from the park in the morning. The television and radio are silent and the only sound is the morning rush hour chirping at the birdfeeder, until even that seems to go quiet. Fully engrossed in my work, I lose all track of time. Startled, I look up. What? I look out the window, convinced I just heard an unfamiliar, high-pitched voice, say leave it. It is dead quiet. There is no one in my yard or either of the neighbors’ yards, that I can see, but the birdfeeder has been commandeered by one of largest crows I’ve ever seen. Easily twice the size of a normal crow, its shimmering, azure-blue on midnight-black wings envelop its unusually rotund body. It stands on the peak of the little roof that covers the birdfeeder and just stares at me, first with one big, brown eye and then the other. It does not eat the feed, just bobs its head up and down as it switches its focus from one eye to the other. I’ve never seen such a fat crow. I turn to get my cellphone to take a picture. I get a chill in my spine, and slowly turn back to the window. The voice sounds like it is coming from my deck. I stand, put my nose on the screen and look along the house half expecting to see someone. There is no one there. I look down under the windowsill, then question if it wasn’t all in my head. The crow is staring at me. It hasn’t moved in over a minute. 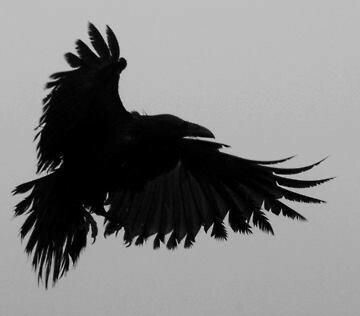 The crow spreads its wings and bobs its head, then caws three times. And then flies off. I watch it circle over my neighbor’s house before it lands on the peak of that roof. It caws again, three more shrills. Though more distant, these caws sound even louder. It sits there and stares at my window. Feeling a little creeped out, I go back to what I was working on and try to forget that I just asked a crow a question. And that it seemed to almost respond. I wonder what three shrills means in crow-talk? I finish my work in time to make lunch for me and the dogs, who by now are awake and hungry. They anxiously watch me prepare their bowls with a mixture of last night’s leftovers with dry and canned dog food. Gracie stands by the deck door and starts one of her deep-throated growls, and I know there’s a squirrel in the yard. But I also know food-in-a-bowl takes precedence. Squirrels are endless entertainment for my dogs, both here at home and at the park. At ages eight and nine, both dogs are now too old and too slow to catch the squirrels over a short distance. My mutts never were smart enough to hunt in a coordinated attack. The critters always hightail it as fast as they can for the trees then climb to an unreachable branch and wait out the dogs. Sometimes, they chastise the dogs with their squeaky, little chatter, and rattle their tails like sabers. I take my lunch to the deck table, but the dogs’ bowls remain inside. I leave the screen door open so they can join me when they finish. There are squirrels in the yard, as usual, but they don’t pay me any mind, so long as the dogs don’t come out. They go back to foraging for their lunch and I go about forking mine. Out of the corner of my eye, I see that fat crow perched on top of my neighbor’s roof. It looks again to be staring right at me. I point my fork at it and say in an admonishing tone, ‘Have you been up there all this time?’ My dogs think I’m calling them and come running. As soon as the dogs’ paws hit the porch, the two squirrels under the birdfeeder bolt. They take their usual escape route and beeline-it for the nearest tree, about forty feet away. Suddenly, the crow swoops off the roof and heads straight for the base of that same tree. It arrives before the squirrels with its wings spread as big as an umbrella. Shocked, the squirrels turn back, right into Joker’s and Gracie’s charge. The crow flies off, but the squirrels are left with only one alternative and that is to try and jump, springboard-style, over the dogs. The squirrels jump, Gracie jumps, too, and head-butts one of them out of midair. Before that squirrel can find its feet, Gracie has her teeth around its neck and starts shaking her head from side to side. Gracie tosses it, and the now-limp critter thuds back to earth twenty feet away. Joker chases it down and bites into its belly, and gets blood all over her white snout. I get the dogs back in the house and scold them, not for killing a squirrel; they don’t understand my words, just my infliction — they thought they were killing it for me. I’m mad because now I must clean off Joker! And now I gotta pick up a dead critter! Yesterday was trash day, so that means I’ll have to bag it and drive out to the park to trash it. Otherwise, it’ll be growing maggots before my next trash day. I aggressively wash off Joker with Dove soap and get myself sloppy wet in the process. Even more pissed off now, I fill a brown shopping bag half way with crumbled newspaper to absorb the dead critter’s blood, then get a plastic garbage bag to put it all in. I grab my garden gloves, a shovel and a bucket and step around the garage to the back yard. That big, fat crow is tearing apart the squirrel and has half of its innards already on the ground. It looks up at me, first with one eye, then the other, back and forth. I don’t move. It goes back to ripping out entrails. It isn’t taking time to eat, just tearing it apart with its beak and claws. Another crow flies in, but instead of attacking Fatso, it lands a few feet away and walks up, picks up one of the pieces that’s already been removed and flies off. Soon, another crow lands, takes a piece of squirrel and flies off. I back-step into the garage. When I get back in my office, Gracie and Joker are watching out the window as the crows descend in their yard. My dogs don’t growl or bark or even perk their ears. They just watch, and so do I. Sortie after sortie, this repeats for nearly an hour. All the other crows look just like crows, not bulbous like this first one. They all seem to come and go in the same direction and I wonder if there is a colony of them, or a flock, or whatever a bunch of crows are called, living in the patch of woods behind my neighbor’s house. I want to go exploring. I suddenly want to know everything I can find out about crows. Fatso flies off last with the remains of the squirrel clutched in its talons. It caws three times. I never did take a picture. Caught up in watching that brilliant bird, it was easy to forget. What I cannot forget is how it cut off the squirrels’ only escape, how it got my dogs to kill its dinner, how Fatso played chef for an entire family of crows, and how it got me to leave it. Engaging story. I wonder if Fatso will return for a third time to party on squirrel meat with his family. I can hardly wait to hear more about this creepy genius. As a believer in reincarnation I wonder who he is, really. Phil, you know I enjoyed your blog. Can’t wait to read what happens next. An ominous sign – will you run into the same crow again? Enjoyed your post! I know crows are smart, but Fatso is a genius. I enjoyed this remarkable story. Thanks, Phil. Thanks Mary… but wait! There’s more to tell!